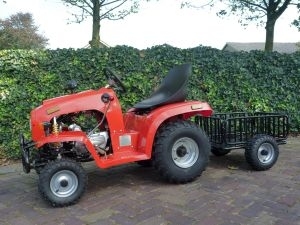 The tractor 110cc is a small, 110cc powerful tractor. This tractor is semi-automatic with three forward and one reverse gear. Especially for children who live on a farm to drive around. For adults it is a fun 'gadget'. The power of the tractor is suitable for both children and adults. Particularly for children who are used to drive on a quad or mini-bike and are familiar with speed. By coupling the trailer behind the tractor, gardening activities can be carried out. Totally fun for kids to parents to help on the farm! Both children and adults will enjoy many exciting hours. This website contains a range of spare parts which is currently in stock. This is just a small list of all the spare parts on this website. For a list of all items you can click on the link below. If there is an item not listed, please do not hesitate to contact us via info@simparts.nl. You can also click on the link at the left of this page under 'Special' 'Contact us'. Fill in your details and try to formulate your question explicit and we will respond to your question or comment as soon as possible. Because of our good contacts in China, we can probably help. The prices are in €, including 21% VAT/TAX, exclusive shipping costs. Placed and paid orders will be sent within 5 working days. Unpaid orders will be canceled after one week. Parts specially ordered at the request of the customer and electronic components can not be exchanged and/or returned. These parts are excluded from the right of withdrawal. Chamber of Commerce Eindhoven 50702890.
distribute without permission of AllSim.